Giant Up 4 It requires strategy and skill. 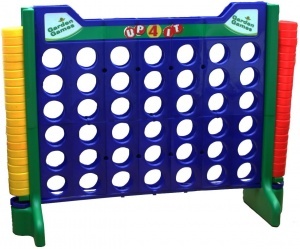 Players take turns to drop their counters in the frame with the intention of forming a line of 4, whilst doing so they must also prevent their opponent from making a line with their counters. 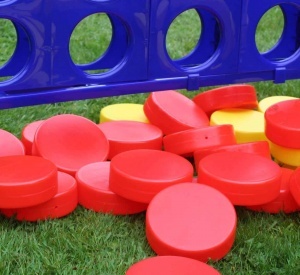 Standing 1.1m tall and strikingly colourful, this game makes a real impact in any garden. Giant Up 4 It is made from hard wearing plastic for a long gaming life. Suitable for 2+ players, age 3+. Includes main game frame, 21 x yellow counters, 21 x red counters and 2 x net counter bags.